I went to Everbind, the parent company of WestSide Books on Wednesday morning to pick up fifty books for the Book Bloggers Convention. I have to say it was very cool. I know, I know. 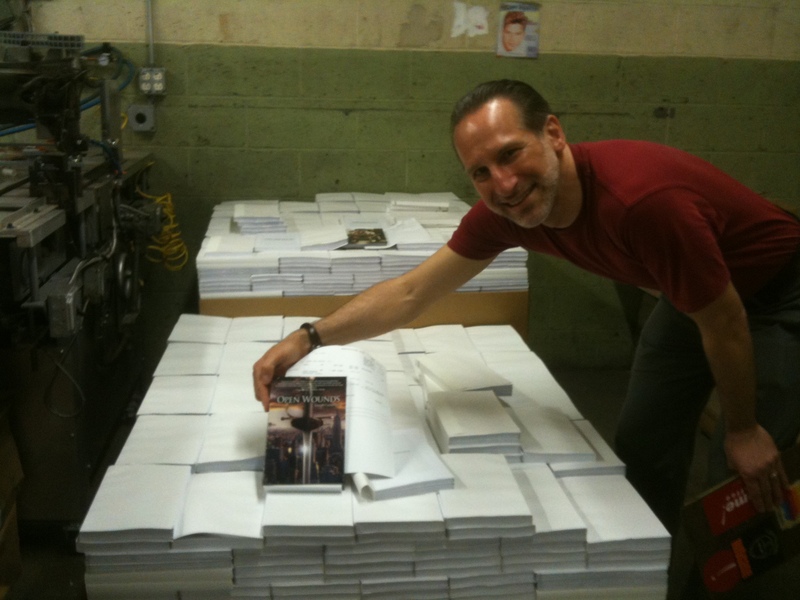 That’s the best I can come up with but trust me, seeing my book, printed but not bound sitting there on a pallet waiting to be bound after seven plus years of work (the picture is my first print run – my first edition) was like watching the book being born. Now I saw my son born and that was about the most incredible and wondrous thing I’ve ever seen and this doesn’t come close but… it was still pretty damned cool. Evelyn Fazio, my publisher/editor, gave me a tour around the binding machines, cutting machines, gluing stations, cover making stations, it seemed like something out of a 1940’s novel. The machinery is all custom-made so I wasn’t allowed to take any pictures of them. Everything seemed exactly the way a factory that put covers on and bound books should (in my world) look like – eccentric, Spielbergian, archaic, sepia-toned, and well, just a bit magical. It fit. It’s a fit place to coalesce the power of the written word and all the wondrous qualities contained within. I don’t think many authors get the chance to see this kind of thing. I’m hoping to be able to bring my wife and son next week when that pallet becomes the final, ready-to-be-shipped and packaged into boxes and put on the warehouse shelves in another part of the airplane-hanger-like space that is Everbind – first edition pallet of books. I have an empty box with the logo for Everbind on it at home. It’s just the word Everbind. But I swear it’s right out of a fantasy novel – a good one – the kind you can’t put down because it makes your heart race and your fingers sweaty because you just can’t wait to see what happens next. This entry was posted on May 27, 2011 by Joe Lunievicz. It was filed under Blog, Open Wounds .